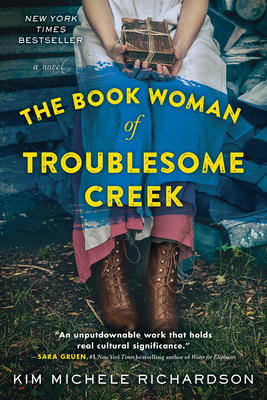 The Book Woman of Troublesome Creek follows the life of 19-year-old Cussy Mary, the last of her kind, in the hills of Kentucky during the Great Depression. Blue-skinned Cussy endures many hardships in her young life, but her saving grace is being a librarian for the Pack Horse Library Project. Her patrons and the books she can deliver to them mean the world to her. Traveling miles through treacherous terrain is nothing compared to the bigotry and threats her and her family face from the townsfolk. Through it all, Cussy Mary shows us what bravery and determination are. Kim Michele Richardson brings us an unforgettable historical novel full of heart with a gutsy heroine to boot! In The Book Woman of Troublesome Creek, Richardson’s often lyrical and evocative writing creates a visually stunning and emotionally tumultuous narrative of a young woman seeking to care for those around her in a truly inspiring and empathetic manner. Bluet faces the brutality of those around her and returns only love. This book promises to be significant for book clubs, as it offers much to discuss with respect to prejudice, subjugation of women, the devastating effects of abject poverty, and the salvation which comes from approaching the world with a sensitivity toward finding the commonality in the struggles faced by all of humanity. I am sure this book will make its way onto all of the important lists. The power of reading between the pages of a book is reflected in this little known story of Roosevelt’s Depression Era Pack Horse Library Project. Nineteen year old Cussy Mary Carter enjoys spending her days delivering not only ‘words’ in books and reading materials to readers in the outlying areas of eastern Kentucky, but also offering her own ‘words’ of comfort and encouragement to people yearning to escape the bleak existence of these remote Appalachian hills and hollows. In spite of being the carrier of a rare genetic trait that causes a bluing of her skin and having to withstand the harsh racial discrimination of being a nonwhite outcast, Cussy takes refuge in her job as a librarian and in her “I have my books” attitude! This well researched historical fiction is so compassionately drawn that every reader’s heart will be touched by the indomitable spirit that fires Cussy’s inner life. Reminiscent of Paulette Jiles News of the World, this is a totally absorbing reading experience. Perfect for book club.